"Our Past is Relevant if we are Aware enough to Understand its Significance to Self"
The following pictures detail the progress from when I commenced into the area of graphic art. It started with showcard and ticket writing on cardboard with a brush and progressed to signwriting with a brush on timber and metal background. And the development continued. After this section there are other design pages, developed for a business project many years ago. This aspect had reasonable success and then I decided to cease this business activity many years ago. There were a number of reasons and not one was prominent. It was just time to stop. After a few life changes I eventually decided to develop this particular web site in 2012. The many years prior was a development of knowledge, both inner & externally, which enabled the creation of this web site. Becoming an extention of the creativity started all those years ago. 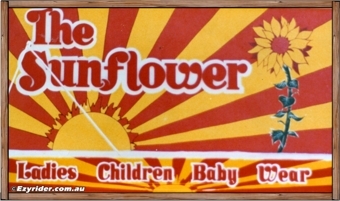 In the late 1970s I started this life with a brush; painting signs on cardboard for department stores (called showcards - see left picture) that promoted specific items in specific locations, with prices. This developed into signwriting with enamel paint on timber and metal for outdoors. I rented a shop and workshop space in town and it went from there. All signs were painted by hand. There were no computers or vinyl letters. If you didn't have a particular proficiency you didn't survive. I survived and not without abnormalities. Combining creativity with responsibilities in a world of competitiveness with personal growth is fraught with undisclosures. I now live in a different world and realm as can be seen within this website. I still create. I have found out it is hereditary. 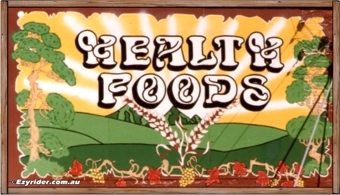 Late 1970s wall mural. Bottom line is the awning. A hand drawing was presented to the customer for approval. The graphic was hand painted on the wall by just feel and eye. Standing back every now and then to see if it looked ok.
Another wall mural late 1970s. A drawing was presented to the customer in black and white. The wall was undercoated first, then painted with gloss enamel with different types and sizes of brushes. The size was probably 2.4 metres high x 5-6 metres. Late 1970s again. A window sign painted on the inside. I drew the graphic on the outside with a white wax pencil and went inside to paint it. The letters were painted first and then the background over the top, then a white coating over the lot to make it look nice inside. The paint came out of tubes. Special window signwriting paint. One day I decided to buy an airbrush. I'd already purchased a compressor to spray the background of signs so that was used for the airbrush. With slight modifications. I thought, I can do that. And found out it was a learning curve. I used industrial paint and had to wear a mask. But you still breathed in the fumes. It helped. These two signs were airbrushed on the rear side of clear 3mm acrylic. That was a challenge but the customer wanted it and I said I could do it. I then had to work out how to do it. The letters were painted first and then everything else laid over the top. There was a lot of movement from the back to the front to see if it was looking Ok. Layering blending at the rear and not seeing it develop was a very big challenge. 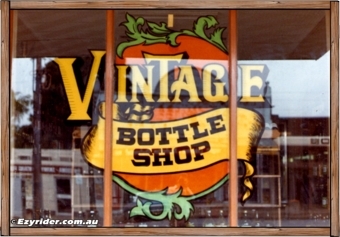 From the late 1970s this business developed into company contracts, that incorporated airbrush graphics and eventually progressed into vinyl lettering. To generate the quantity of basic signs for a company contract I had to employ staff. I recently caught up with my right hand man from those days after 30+ years. He still remembers. Gradually, from my experience after the late 1990s, proficiency eventually was traded for superficial instancy and price. I am currently processing a history of personal signwriting during this stage of my life, with pictures of painted signs from that era. Part of that is above. These are from a man who had no formal training; just a get up and go strategy to produce signs with varying designs and personal style. Each header title below will lead you to the different web pages for each specific product area. Many of these designs are computer generated from a Corel graphics programme. They were created for a business project many years ago. The Menu board section shows photos of menu boards I created with an airbrush and other methods. Click on the title header for the area you wish to look at. All designs are copyright protected - see bottom of this page. 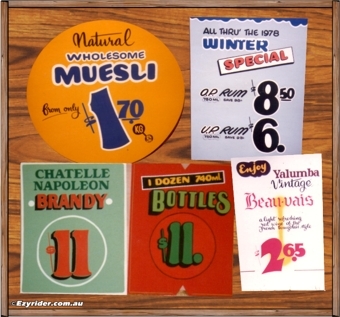 These designs cover a range of ideas with prices of the signs at that moment in time when I created them on a graphic programme on the computer. The idea was people could select a design and change it with their information depending on what felt good for them. I've always like timber signs and these were designs created for the customer. Cedar was cheaper in the old days so I opted for oregon timber in this future. It sort of worked but the oregon was hard to work with and manipulate to what I wanted. So went back to cedar. It was softer and easier to create with. But expensive. These design show creations on the graphics program....but also actual menu boards I created. The pictures on the above graphic were created for actual signs and sold as such. This is when I moved away from airbrush painting graphics. The fumes would have probably killed me eventually. Not only the fumes but I was getting industrial paint on my skin. It became a health problem .... mentally also, as I started to get spaced out using this type of paint. The above pictures were created on the computer. Each piece of food was created and put together within the graphic to make a whole. It was then printed, stuck to a primed piece of MFD board, and then a clear vinyl sheet was put over the top. The edges were painted and all in all it looked good on the menu board. The other sections were raised also - the titles. Sometimes the blackboard section was cut out and tacked to the background. Sometimes it was painted onto the background. Doing both the titles and the pictures was time consuming but great for the creativity in manipulating all the funtions in the graphic programme. Did I get taught to know how to use the graphic programme? No. Just got in and had a go. Just like the airbrush. I also created a design section for tradesmen for the web site. These are just some of the creations. Like the other the customer could change the details to suit his business. The is the personal design section. This was quite fun to create as I started to use a 3D programme and manipulate it through another graphics programme to get the result I wanted. Note the timber backgrounds. 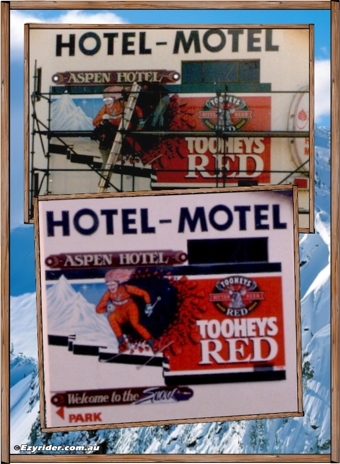 The customer had the option here of having the whole sign printed or the body printed, stuck onto a piece of timber and then attached to the background. This would give the raised look. And the border could be actual picture framing from the shop. 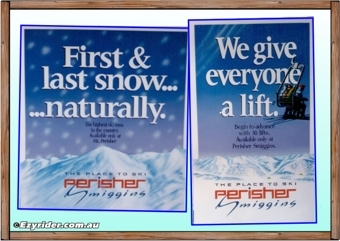 This web page shows a variety of timber office signs/designs. This is the Celtic-Medieval Design page. Again, the same could be done here as the previous web page above. Coming up with the wording was a challenge. The pictures were always interesting to work with. I like the mystic way of life so these were right up my alley. I've still got some of these stickers today if you would like to buy them. If you are a sign/design business/person and are thinking about using my designs for the promotion of yourself or business with the intention it is your work: Don't - As they are copyright protected. You are restricting your creativity by considering this, by not using the prefrontal cortex of your brain, which when activated, formulates conscious awareness, develops creativity and invention and progresses you through your life. It is also an indication you are only using your left brain rather than your right. Using your right brain would expand your knowledge and creativity, rather than operating on left brain past programming. All this takes weeks, months and years.